Plot Outline: When Scrat accidentally provokes a continental cataclysm with a storm, Manny is separated from Ellie and Peaches on an iceberg with Diego, Sid and Granny but he promises that he will find a way to return home. While crossing the ocean, they are captured by the cruel pirate Captain Gutt and his crew. However they escape and Manny plots a plan to steal Captain Gutt's ship and return to his homeland in a dangerous voyage through the sea. 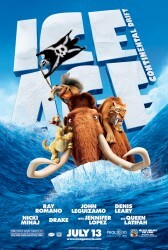 But the cruel pirates seek revenge against Manny and his family and friends.